So, to top everything else off, I've been fighting off a cold for the better part of a month now, which finally took it's final toll and sent me to the doctor. On that note, I can't believe I'm already 7 reviews behind! I don't think I've ever been this far behind before, but I've barely had the energy to read, let alone write about what I've been reading. While these books are probably ones that I wouldn't have picked up on my own, I'm always on the lookout for new authors, and these are all new to me, so I'm pretty excited about reading them all. Thank you, HarperCollins! Dear Patient Reader, thank you for being so patient. It's been a long week. It's been a long couple of weeks. However, I have been reading! I just haven't had time to post my reviews yet. They are coming, though, I promise. I'll have them written up and start posting them this weekend. It's no secret that I adore Audrey Hepburn, so it comes as no surprise that I'm thoroughly excited about this book! Here is a delightful little trailer for Just Being Audrey by Margaret Cardillo and illustrated by Julia Denos, from Balzer + Bray available January 25, 2011. Enjoy! The Hunting of the Snark, Lewis Carroll’s classic masterpiece of nonsense verse, takes the reader on a wonderfully witty and inventive hunt for the ever-elusive Snark. The tantalizing mysteries of the poem are here perfectly matched in these brilliant new illustrations by artist Mahendra Singh, who has created a visual treasure hunt, full of riddles, puns, and allusions. What does it all mean? No one seems to know. Not even Lewis Carroll, apparently. He claimed to have no more idea on what the poem was about than anybody else, although he did mention at one point, "...the whole book is an allegory on the search for happiness." 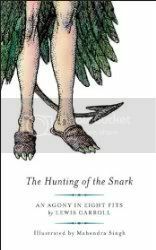 Carroll's acme of Nonsense poetry, The Hunting of the Snark: An Agony in Eight Fits is an experience to read. Does it make any sense? Not at all. Did I enjoy it all the same? Absolutely. This was a Christmas gift from my friend Sarah as I'm a huge fan of Carroll's Alice's Adventures in Wonderland and Through the Looking-Glass. However, I'll admit that my reading experience with Carroll stops there, so this was a real treat to receive as I had not even heard of this book before! The poem opens with the captain of the hunt gathering his traveling companions for the voyage that will take them to the Snark, so that they may hunt it. As the poem progresses, I was left in mind of Chaucer's The Canterbury Tales, as we get to hear tales from most of the traveling companions. Each tale leads on to the continuing hunt for the Snark, which leaves its mark on several of the traveling companions. There are several plays on words in the poem, and we even meet a couple of familiar faces from Carroll's earlier works, such as the Bandersnatch and the Jubjub Bird. Mahendra Singh's illustrations are simply amazing. In his afterword, he explains how he used a Surrealist technique to illustrate this version of The Hunting of the Snark, a technique which I think fits the theme and tone of the poem perfectly. Singh hides jokes and visual puns in his illustrations that go along with the poems stanzas, just as Carroll hides puns, plays on words and puzzles in his poem. As I read through the poem, I would become equally involved looking at the illustrations as I was trying to figure out what it all means. I eventually gave up, and enjoyed the entire book exactly for what it is: Nonsense! Even though it took me a couple nights to read, The Hunting of the Snark is a very fast read. In fact, I read through the entire poem a second time in one sitting, making sure I was able to follow what was happening. Even though there really isn't much rhyme (no pun intended!) or reason to the flow of the story, it still makes some sort of absurd sense and follows a natural progression to its ending. What you'll get out that ending, however, will differ from person to person. Personally, I think Carroll had it right about his poem: it has something to do with the elusiveness of that one thing in life that will make you perfectly happy. You search and hunt and may never quite find it, but it's the searching and hunting that turns the journey into an adventure. It's a Bookalicious Anniversary, and we're the ones getting the presents! Pam over at Bookalicious is celebrating her two-year blogging anniversary at Bookalicious, and has she got some great prizes for us to help her celebrate! The ultimate prize? A NookColor! Click here to learn more and to enter into her great contest. While you're there, be sure to wish her a happy anniversary!! Reporting bookstores: Anderson's, Naperville and Downers Grove; Read Between the Lynes, Woodstock; the Book Table, Oak Park; the Book Cellar, Lincoln Square; Lake Forest Books, Lake Forest; the Bookstall at Chestnut Court, Winnetka; and 57th St. Books; Seminary Co-op; Women and Children First, Chicago. Kindle Geeks: Ebooks for Your Geeky Side: 99 Cent Steampunk Ebooks for the Kindle: "So, you like steampunk? And you like a good deal? Good! Today's post highlights five steampunk ebooks currently available for 99 cents in the Kindle store." I just thought I'd pass this on. Sounds like a great deal, and one that I'll be taking advantage of! One of the most successful and popular artists to work in comics, Jim Lee is revered by fans worldwide thanks to his hyper-dynamic artwork and innovative character and costume design. Now, his work on Batman and Superman — not to mention his legion of WildStorm heroes including WildC.A.T.s, Divine Right and Deathblow — is celebrated in this beautiful hardback, which includes an exclusive interview with Jim Lee, a tour of his studio and hundreds of full-colour illustrations and pencils spanning his entire career! Plus an all-new cover by Lee and an exclusive, all-new eight-page comic strip, written by Paul Levitz (Legion of Super-Heroes) with art by Lee! 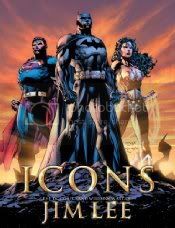 A fantastic retrospective on arguably my favorite artist out there, Jim Lee, Icons is a beautifully presented volume covering Lee's time with Wildstorm and DC Comics. Including artwork that covers his entire career with both companies including sketches and art that I've never seen before, this really is the perfect book for any Jim Lee fan. The physical look of the book, too, from the shear size of the volume to the layout of the interior pages does nothing but add to the beauty of the book. I think that this is a volume that can truly show that comics are not just a form of entertainment but can also be viewed as a true work of art. Bill Baker's running comments on the art and background information on Lee and his studio makes for a nice finishing touch. Naturally, the only thing that would make this volume perfect would be to also include his art and time with Marvel, but since he is now DC Comics' co-publisher, this may be the best book that we'll get for the foreseeable future. Highly recommended to anyone who is a fan of Jim Lee's artwork or to anyone who enjoys a beautifully presented book of art. Favorite "New to Me" Series of the Year: This is going to be a tie between Gail Carriger's The Parasol Protectorate series and Naomi Novik's Temeraire series. Both are equally fantastic! I know I was a little heavy on the graphic novels this year, but I had a particularly challenging year personally in 2010, and I generally fall back on graphic novels as a safety for my reading time, so in 2011 I'm hoping to maybe balance everything out a little bit better. But really, I love graphic novels, so I'm not too concerned about it. 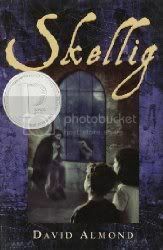 One thing that I've promised myself for this year is NO READING CHALLENGES! I felt like I bogged myself down in challenges last year, and I want to be able to just read what I want to read. If something I'm reading lines up with a particular challenge or group read, I'll join in then, but I really want to leave my reading schedule completely open and see how that goes. Anyway, so there it is. 2010 was a great reading year. Lots of fantastic books, and some seriously wonderful new authors, and I'm looking forward to just as much reading pleasure in 2011. Happy New Year, everyone, and happy reading! I'm not going to lie. I rewrote this post after reading Literary Feline's year end recap post over at Musings of a Bookish Kitty. I just loved it and wanted to borrow a couple of the elements. If you're reading this, LF, I hope you don't mind! Mea culpa!